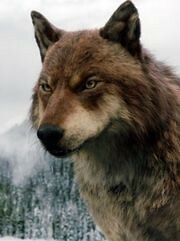 Suggested by Destroyer Jacob may be a werewolf but that doesn’t mean he is ready to take on someone like Levi. Levi has been slaying titans for years and continues to excel at that. Compared to those opponents, The Werewolf may as well be a kid asking for Cookies. There is certainly no threat to Levi and his 3D gear. Levi wins. It’s time to look at another Attack on Titan OVA. I read the manga version of this one a while back so I basically knew what to expect. I definitely considered it to be one of the better spinoffs and it did a good job of making Levi a good character. The main series disregards that of course as it makes everyone compromised by the end, but that’s why prequels can be cool sometimes. The OVA is divided into two episodes with the first one being really good and the second one pretty bad. The mix makes for an outcome that you’d probably expect from the franchise. The story starts with a girl named Isabel running from shady fellows who are unnecessarily gritty as always. Levi stops them and the guys retreat. Isabel realizes that learning how to fight would be pretty useful here so she joins the group and becomes one of the team. The other member being Furlan. She gets the hang of things rather quickly. 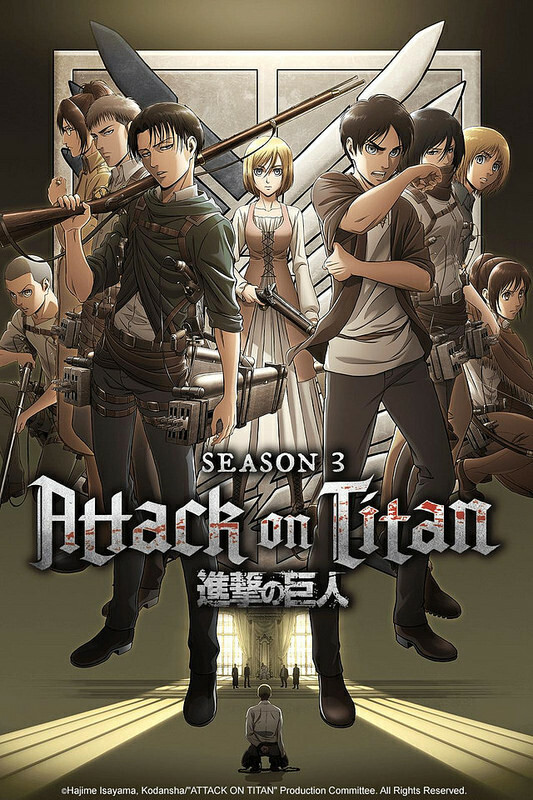 Unfortunately, one of Levi’s comrades is taken to a hospital and held as a hostage so he and his team are forced to join the Survey Corps to murder the commander Erwin to help a corrupt politician escape persecution. Can they accomplish the task before they are eaten by titans? The first episode is pretty fun. It still gritty in some aspects, but there aren’t any titans running around. It’s just Levi and the others trying to survive the slums. Levi’s a pretty stand up guy who looks out for his comrades and he gets a lot of respect around the place. He’s the kind of heroic main character that you’d expect to find in a Shonen. He goes through with the scheme to get Erwin because if he doesn’t his friend will be in trouble. He’s just a great all around lead and he also knows how to fight. His 3D Vertical maneuvering abilities are second to none. Furlan is a good second in command. 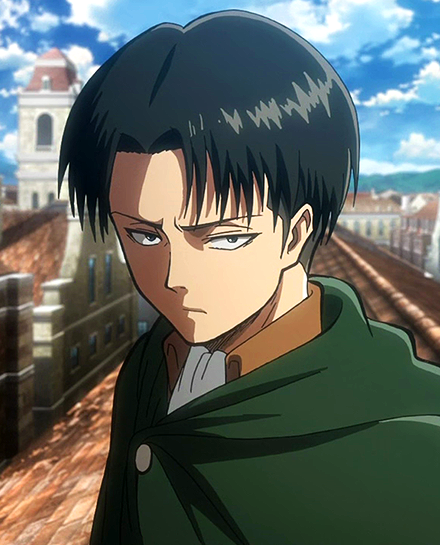 He doesn’t have much character except that he is always ready to help Levi and also stands up against injustice. That’s good enough for me. Finally, Isabel is a chipper young cadet who is eager to help out. Her first scene has her protecting a bird which is a great start and it even gets to live which makes the whole thing even better. The dynamic between the three characters is pretty fun and that probably would have made for a pretty fun show on its own. I had no real complaints with the first episode. The animation was sharp and the soundtrack was good. The ending could have even worked as an ending since it shows how he joins the corps. The second episode is where it all goes downhill. The first half wasn’t bad as we see the characters excel in the Titan hunting practice. Levi may use an unorthadox grip, but it gets the job done. The other members may not like it, but as long as he gets results they can’t do much about it. They still plan to destroy Erwin, but there aren’t really any openings for them to accomplish this. The guy is like a stone wall that blocks everyone off. Finally, they get their chance on a titan hunt when the rain gets extra thick. Levi goes ahead to take Erwin down, but as he leaves a titan murders all of his friends so he murders it as well. In despair, he decides to follow Erwin’s cause so that his life can now have meaning. Erwin’s not very sympathetic to the whole situation as the show portrays him as a guy who’s been around the block many times. None of this is as a surprise to him anymore and he’s made of sterner stuff. He’s willing to cross any line if it means defeating the Titan so he’s not really a hero. He just aligns himself on the same side as the main characters. He’s not my kind of character, but he’s certainly someone who’s useful to have on your side. At least he saw through Levi’s plan the whole time so he’s fairly cautious. It makes sense to be suspicious when the characters were caught so easily. I like to think Levi would have defeated Erwin in a fair fight. What hurts the second episode is naturally how super violent and dark it is. The animation uses a detailed style to try and make the deaths as graphic as possible. You see the spine and body parts as their remains are found. It’s definitely super done and likewise with Levi’s fight against the Titan as he keeps on slashing it over and over to take his rage out on it. I would have preferred the light novel approach where Titans just turn to steam and don’t really bleed. Those were the good ole days. Levi was still a great character of course as avenging his comrades is the first thing he should do and he did abandon the mission to check on their safety right away. It’s like Spider-Man’s origin story as his choice ultimately decided their fate. He couldn’t do everything, but the overall message of the OVA was good. You can’t regret your choices when you don’t know what outcomes they will bring. Some choices lead to positive outcomes and some don’t. As long as the decision itself was good, then you shouldn’t actually have any regrets. Levi’s reasoning for joining Erwin wasn’t bad either. I definitely think part of it was helping to avoid what happened to his friends to anyone else. Who wouldn’t want to stop the Titans after that? What makes it more painful for him is that he warned his teammates not to come. Their skills aren’t at the same level as his so it makes sense that it would be dangerous for them. Still, it’s not as if he could have stopped them from coming in the end so what’s done is done. It’s a pretty sad ending to the OVA and I would have preferred the first one, but it shows why Levi is so cold to everyone. As I mentioned earlier, the graphics are really good. All of the character models are really high quality and the fight scenes are smooth. The Survey Corps battle with Levi squad is definitely the best part of the whole thing. The animation and directing did a good job of showcasing their speed without getting distracted or spinning around in an attempt to look good. Some anime try to do that to be clever, but it’s a cop out. The soundtrack is also great as it grabs a lot of the good themes from the anime and plugs them in. The fun techno theme is always a fun addition and I’ll never forget it from the very first Attack on Titan episode. It was a good way to start the series….for an instant. Overall, No Regrets had a solid beginning, but a weak ending. It’s a little too dark/gritty/tragic at the end which brings down the score considerably. That’s why Attack on Titan will always be limited since it always goes down when the Titans appear, but a series without Titans would be a completely different show. Still, it definitely has an interesting premise and I’d probably recommend checking it out over the main show. If you like the OVA then you should go ahead and watch it. The intro is included here and some quick exposition so you’ll know what’s happening from the get go. I have another OVA coming up and it has the potential to be the best yet as we return to the main cast. It’s hard to say which ending was more tragic and mean spirited, this one or Ilse’s Notebook. I dare say it would be the latter since Ilse was by herself and pretty much defenseless while at least Isabel and Furlan had each other, but it’s close. Hopefully the next one has a happier ending so it can end the OVA on a solid note. Levi is very fast and considering that he’s only human, he’s pretty impressive. 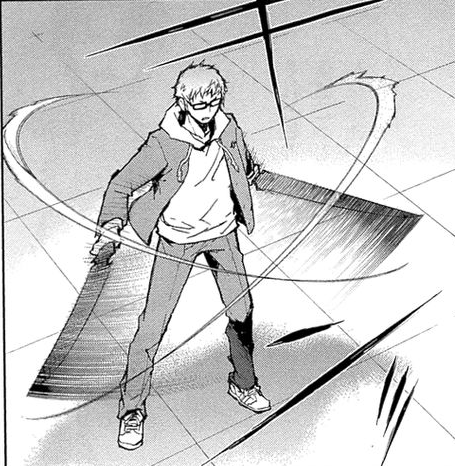 That being said, Shiho finally learned how to use his demon’s power, which has increased his attack power and speed. His coffin ability is anything but impressive at the moment, but it’ll probably have some nifty feature at some point. Either way, Shiho can definitely defeat Levi in a close quarters fight and that essentially nullifies all of Levi’s options. Shiho wins. 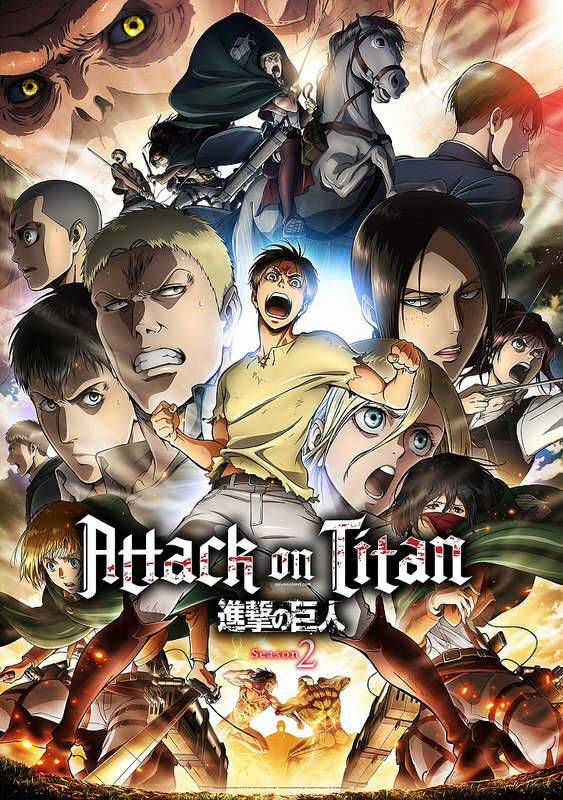 Attack on Titan has easily become on of the most popular anime titles of all time. It became an overnight sensation when the anime started airing and rose to heights that only premiere titles like DBZ, One Piece, and Sword Art Online reside. I wasn’t born early enough to fully appreciate the hype of DBZ and One Piece was more of a gradual burst than such a quick burst. So, I can only compare it to Sword Art Online in that regard and I’ll make more comparisons as the review goes on. Let’s face it, you’ve probably seen the poster above this a million times by now. It’s a pretty incredible way to hype up the show. I did read the manga prior to watching the show so I knew what to expect and it definitely isn’t my cup of tea, but the series had so much potential that it’s scary. It’s a series that really had everything in its favor (Like Sword Art Online) and just messed up on some of the fundamentals, which held it back. Well, where to start right? I think that I’ll start with some of the big positives so you can see just how much the show had going for it. I’m not typically into voice acting since most voices are good enough for me to still enjoy the characters, but Attack on Titan has one of the best voice actors in the business for the main character. 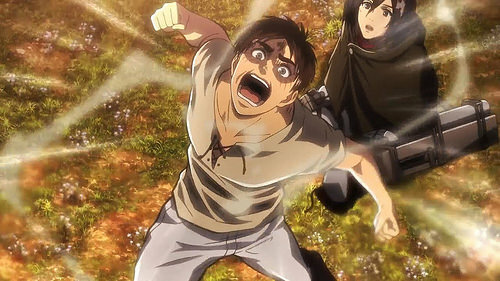 This is a great advantage since Eren’s personality revolves around his constant yelling and determination. He’s constantly talking back to someone or thinking up a plan. He’s a great main character in many respects while falling short in others. I’ll talk about him more in detail later, but the voices are very good for the show. The animation is pretty great as well. I don’t consider it to be very legendary or awe inspiring, but you can still tell that this is a relatively new anime. The main reason why it is not used to its fullest extent is because the anime is very grounded. There are no energy attacks or cool designs to really be found here. 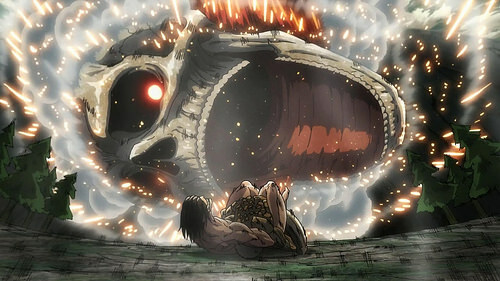 That being said, we get glimpses of how the animation could have looked when Eren transforms or when you see a gleam in the Female Titan’s eye. The animation is pretty in depth and it’s another positive to throw in Attack on Titan’s corner. We also can’t forget that Attack on Titan has one of the greatest soundtracks in anime history. There are very few shows that can even come close to attaining the array of songs that Titan possesses. Everything from the openings to the talking themes to the battle music is great here. There are naturally many themes that aren’t as good as the others, but I can name at least 5 very catchy themes and that’s a great amount. The main Titan theme is a classic, Mikasa’s theme when she tries to avenge Eren is awesome and Eren’s final awakening during the second last episode had a great theme as well. These themes really enhance the scenes and make everything a lot better. It’s hard for you to stop your heart from racing when the music starts to pick up. Finally, the show also had a great director. I don’t know who directed the show, but he knew what he was doing. It’s basically the opposite of what I’ve come to expect from Naruto Shippuden. He can make just about any scene interesting. That’s something that many shows simply can’t pull off. Even if it’s just your average “Characters Introduction Montage” it will still be infinitely more interesting than if someone else had attempted to adapt that scene. As you can see, Attack on Titan had some supremely overwhelming positives on that side. Stellar voice acting, An amazing soundtrack, great animation…..how could it not be the next big thing? Well, you can have these positives over and over, but you won’t get very far if the source material is no good. That’s the case with this series and it’s where things start to go downhill. It’s different from what happened with Sword Art Online. Sword Art Online had all of the positives that I just mentioned for Attack on Titan and it was on pace to become one of my favorite shows of all time. Then arc 2 happened and the show went from being a possible 9 all the way down to a 5. It was just terrible and distasteful. Attack on Titan sets the tone from the very first episode and I knew that things were going to get dicey very quickly. The big factor that really shreds Attack on Titan is the excessive violence. Toonami somehow managed to squeak a TV 14 for this show, but you can definitely tell tat it’s basically at a TV MA level. I think the only reason why the show gets away with it is because the Titans are like monsters and we know how lenient the rating system is with Godzilla. The show may tone down the manga at certain points, but it also increases the violence in others. Case in point, the final battle between the Rogue Titan and the Female Titan. Many parts of that fight were made up or extended to make the fight that much more drastic. It went way over the top in several scenes and you couldn’t root for either one of them. It’s hard to decide which episode was worse, the final one or the first one. Both of them are fighting for last place alongside one of the Hange episodes. 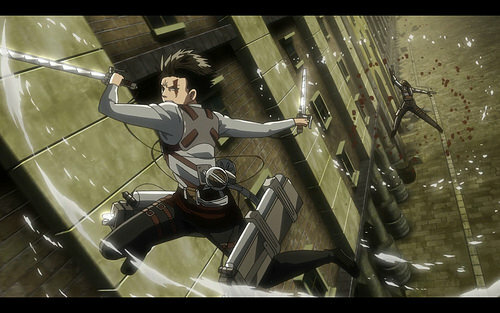 Mixing the excessive violence with the dreary tone of Attack on Titan is definitely a devastating combo for the series. It’s actually day time in just about every episode, which is why I can’t really think of it as a horror series, but they do make sure to show you that the humans are doomed just about every episode. The series is way too dramatic for its own goods and the heroes are constantly talking about how corrupt everyone is. There will also be a background character in just about every episode who panics and gets the crowd going. A lot of characters express how they don’t want to die just before doing so. These things are here to provide us with more emotional or shock value, but it gets old after it happens over and over again. Because of this, I found that most of my favorite episodes in the series were the ones without any actual fighting. I’d compare it to Fate/Zero as the characters are very interesting and the world building is solid. I think the show could have scored at around a 7 if it had just been about their strategy discussions and then we skipped the actual fights. Of course, there are exceptions. The Hange episodes didn’t typically have any fighting, but they were pretty bad. On the other hand, the first battle between the Rogue and Female Titans was pretty good for the most part. So, I can only say that the majority of the action scenes were what drove it down. Some episodes seemed to handle the fight scenes better than others. One episode may have someone destroying a Titan and it appears to be very violent while another may take down a Titan without that much blood. It really varied on who was animating the episode or how much emphasis they had to make. I was pretty disappointed with the final fight in the series because they definitely wanted it to have an extreme ending. The animation itself may have hurt it there as well since they make sure that the Female Titan looks very ugly and deranged by the end. Of course, Attack on Titan would not be very popular without the action so it’s certainly a double edged sword. Eren is a pretty intriguing character. He doesn’t really like to eat as you would expect from the typical main character and he’s actually decently intelligent. He does have a lot of determination and he’s quick to get into a fight, but he’s definitely not your average main character. He’s a good character to an extent, but it can still be a little hard to root for him since he’s forced to bend to the show’s rules. He hesitates before attacking one of the villains and you can make a lot of guesses as to why. Does he simply not want to destroy her? Can he still not believe that she is an enemy? Or is he just afraid that he will lose? Ultimately, it doesn’t matter because he just enters into a rage moment and attacks without mercy. There are many times like this where he just gives into the rage and forgets what is going on. He certainly yells more than most main characters, but the voice actor assures that this is done flawlessly. He is pretty brave and he’ll definitely put his life on the line to help his friends without hesitation. He wants to save the world and his goals are just. It’s just too bad that he lets the government push him around so much. It’s also hard for him to control the titan form for a while and you would think that it wouldn’t take so much effort with his determination. After some twists that are shown at the end of the season, it really makes you think about it. I don’t think that there is a really good reason for Eren to have that kind of trouble. He overestimates his abilities, but that doesn’t stop him from trying. As a kid, Eren manages to take on two adults, which is impressive. Eren does face one big decision towards the end of the series where it’s tough to know what to do. To avoid spoilers, I’ll offer up a hypothetical of a similar scenario with the same options. 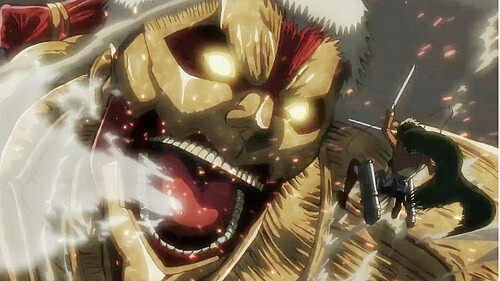 You are the only human who can turn into a titan and then your squad is attacked by a Mega Titan. You are with the world’s strongest human and a group of elites. The strong guy is the leader and he tells you to stand down as you guys will just continue to run away. The Titan is gaining ground and you can choose to turn around and fight (At which point the leader and the elites will enter the fray to back you up) or you can trust in the leader and keep on going. Eren makes one choice and I made the other one. I’ll give you a hint…sometimes the leader’s judgment has been clouded from experience. 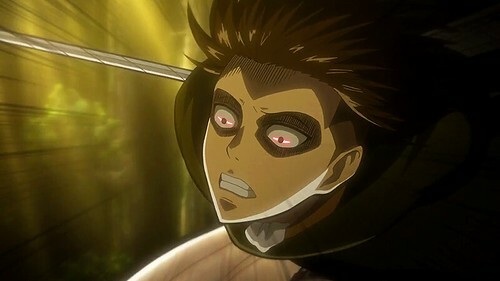 Either way, I suppose that I can’t…..fine, I do blame Eren for making the wrong choice. It cost a lot of lives and I didn’t think that it was a close decision It was a no brainer for me and that didn’t help Eren’s case. Also, one of the series’ ongoing messages is about how you have to forsake yourself and become a beast to defeat one. Eren is constantly told to let go of his humanity and to truly join the ranks of mindless monsters/evil. He basically starts to listen by the end and most of the other heroes are already corrupt through and through. I certainly wouldn’t call Eren a bad main character, but he definitely could have been a lot better and I could see him going downhill from here. We’ve already seen that he is starting to crack and let’s just say that his hatred for the titans continues to grow as time goes by. 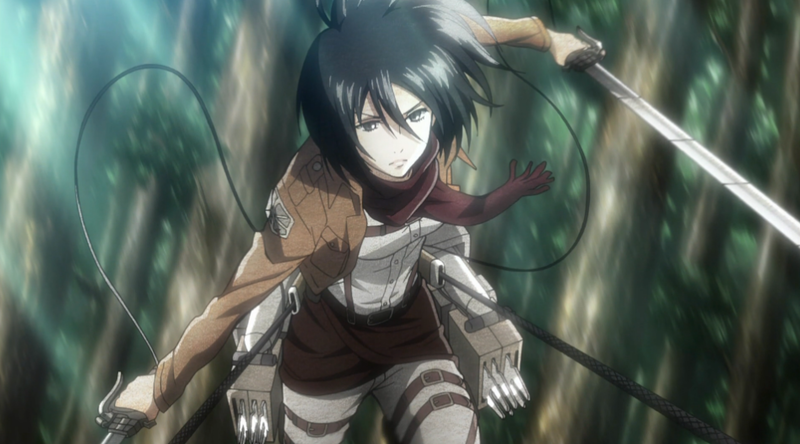 Mikasa is the main heroine and she is one of the toughest fighters. From the start we see that Eren is the loud main character who is determined to win while Mikasa is the silent, but deadly assassin. She destroys more titans than just about any other character in the series. Levi is probably the only one who possibly matches her in that regard. The show makes it clear that Levi is still the more skilled fighter, but considering that Mikasa didn’t have any real combat training at the beginning, she did really well. 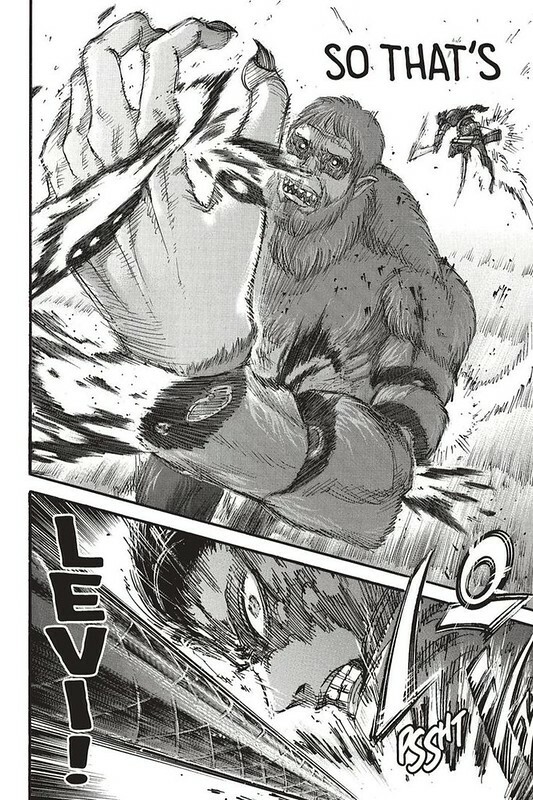 Her rage moment where she attacks a group of titans to avenge Eren is great and she also takes on the Female Titan, a great feat for a human. She’s easily the best character in the show. Levi is the fan favorite character and you’re reminded why he’s supposed to be an awesome character with just about every line. He is able to fight the Female Titan and hold his own with relative ease and he’s supposed to be the strongest human in existence. His speed is completely superhuman and you can’t doubt his abilities. That being said, I can’t say that he’s a very likable character. He went way over the top when beating down Eren and it was hard to find him likable after that. It may have helped Eren out in the long run, but there were surely other ways that they could have accomplished that. 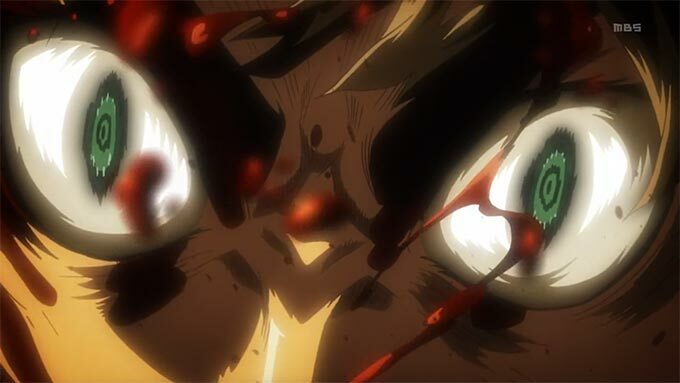 I also don’t think Eren should have lived through such a beating, at least the way that it was animated. Levi is one of the characters who goes downhill from here so brace yourself as season 2 approaches. Annie’s role will seem to be that of the overshadowed side character for a while. She’s a part of the squad along with a few other guys from the intro montage, but then she disappears for a while. She’s pretty mellow compared to the other recruits and while she acknowledges that the world is corrupt…she doesn’t do anything about it. Really, there’s not much that you can do in such a system so I guess I don’t really blame her. Sasha is a pretty minor figure as well, but she values the importance of a good meal amidst the battles so that’s always a good thing. She’s pretty likable right from the start. Hange is easily the worst character in the show and she does a good job of bringing the show down a even further. There is no way that you can call her a hero by any stretch of the imagination so it’s very difficult to see the main characters working alongside her. Do they not comprehend just how awful she is? She delights in the pain of others and she’s just a very warped individual. The situation has likely caused her to become insane, but the heroes shouldn’t give her such free reign. Of course, they’re not really “heroes” themselves, which makes things dicey. The Female Titan is the final boss of the series and she’s definitely very skilled. Her hand to hand techniques are enough to give The Rogue Titan a good match, but her best advantage is easily her ability to harden a part of herself. She can use this ability to offensively attack someone or to block an attack. That’s why it’s no exaggeration to say that she may be the strongest fighter in the series. A battle between her and the Colossal Titan would certainly be interesting to say the least. The Colossal Titan is a figure that just about everyone should know from the posters. He’s a pretty iconic titan and fans were probably disappointed when he only got a few minutes of screentime in the series. He’s definitely the kind of villain that you want to see more of. He’s more interesting than the other villains at the moment and he did have a pretty great cliffhanger during one of his appearances. Well, we can be sure that he will appear more in the next season. Armin is one of the main characters and at times he feels more like the lead than Eren. He’s the calm and collected character who tries to set the mood for the audience. He is always going on about how we need to lose our humanity and become monsters to fight the Titans. Forsaking our morals and doing what’s “necessary” is the only way to win this war according to him. At least he’s not pretending that he’s a hero, but this starts to grate on you very quickly. He’s also not much of a fighter and he cracks one or two times. His big moments didn’t help me gain any respect for him. Jean starts off as the classic bully and develops into the capable leader. He’s a pretty decent character by the end as he decides to fight for justice. He also doesn’t have any qualms about insulting the squad leaders as he moves up the ranks. He’s sort of like a kid version of Erwin so he hasn’t been fully corrupted yet. He could end up being one of the best characters in the series if he plays his cards right. Erwin is Levi’s mentor so you can probably tell that he’s not going to be one of the most friendly members. He talks about strategy a lot and he’s totally willing to break a few dozen eggs in in order to make his omelet. The ends totally justify the means for him. He is dealing with a corrupt government so it’s tricky for him either way, but I couldn’t call him a hero either. It should be noted that things will likely go downhill for him in season 2 so this is really his best season. So, time for some final comparisons to Sword Art Online. They both have a lot of similar aspects and both of them had disappointing finishes, but there can be only one winner. I suppose that this answers the question. From the two shows that completely shattered social media and our minds as a result, Sword Art Online wins. It had an amazing beginning and I could see why it will always be remembered as a legendary anime. 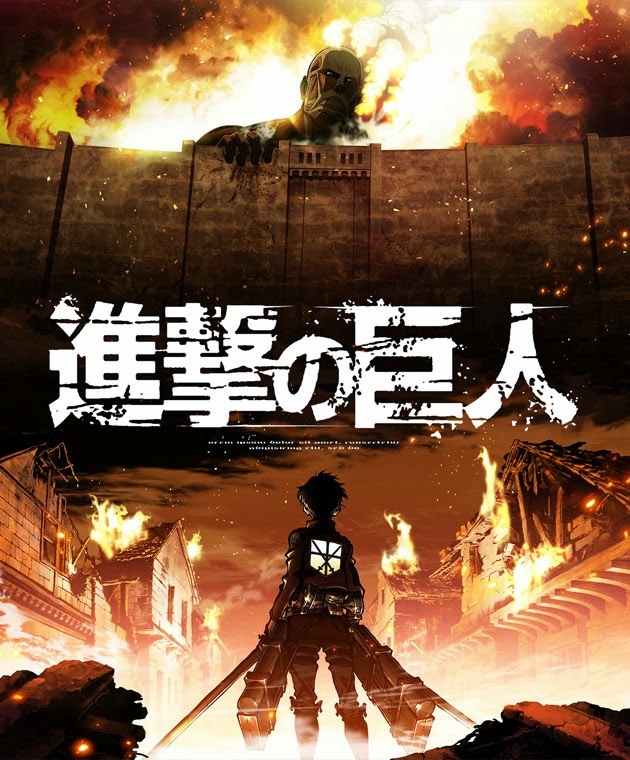 Attack on Titan was certainly revoloutionary in its own right and since it was Japan’s answer to the Walking Dead, you can see why it had such a large audience over in the states. The problem is that it appeals to a completely different crowd than me. I reeeeeeeally do not like the Walking Dead (I don’t like Zombies at all) and I don’t care for the concept of Titans as the main villains. It’s why I didn’t care for the concept of Attack on Titan in the first place and why all of its great features could not save the franchise. 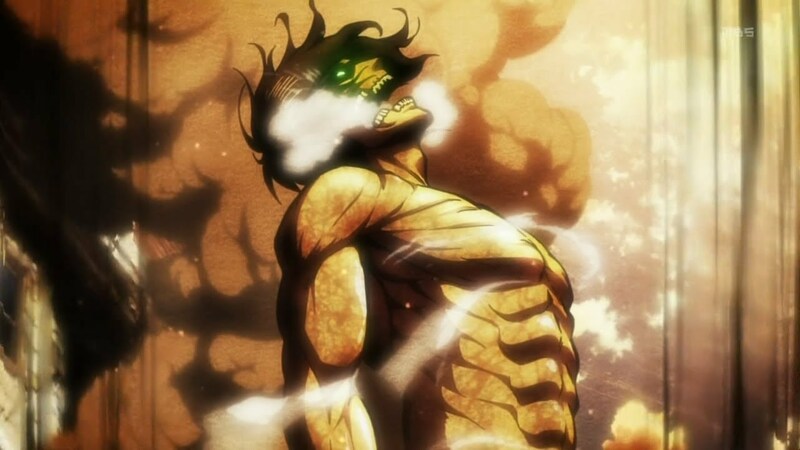 Overall, Attack on Titan is the kind of show that you really want to like, but are unable too. The negatives manage to outweigh the positives and you’re left wishing that it could have won the battle. A video game has the potential to be pretty honest with a “Spiderman” sort of gameplay as you try to slay the titans. The franchise still has potential, but most of it has squandered and there probably isn’t a whole lot of hope left for it. The only piece of the franchise that I liked a lot was the Junior High spinoff. The Levi prequel was surprisingly good for the most part as well. If you don’t mind a whole lot of violence, then I actually would recommend this title since that is mostly what deters me from it. The other aspects are mostly pretty solid. That being said, for a similar experience of top notch quality, check out the first arc of Sword Art Online. Mikasa and Levi are both known as experts in the Titan world. Mikasa was established as the best Titan slayer from the beginning and Levi quickly tried to steal this title when he appeared. “Tried” is the key term and I still acknowledge Mikasa as the better fighter. She has easily taken out multiple titans in the past without breaking stride. Levi definitely talks more, but that’s really his only edge. His arrogance would lead to his downfall. Mikasa wins. Update! Well, the anime was a littler exaggerated with Levi’s speed during his battle against the Female Titan if you ask me, but it is what it is. Whether it was exaggerated or not, the speed feats happened so he would have to win this battle. Mikasa now sinks to 0-2…Levi wins. Attack on Titan is still mega popular and that won’t be changing anytime soon. The anime was a big hit and now we have 4 different manga series with many more likely on the way. This one finished pretty abruptly with two volumes, but it goes to show that some prequels do know when it’s time to quit. I think they made the right move keeping this to two volumes because they can blast through the plot a lot quicker without having any pacing problems. The plot involves Levi and his two friends: Isabel and Farlan. They are from the underground area where thugs run rampant and it’s very chaotic. They are used to just trying to survive and they are experienced. One day, the Survey Corps arrives and they force Levi and his partners into joining them. 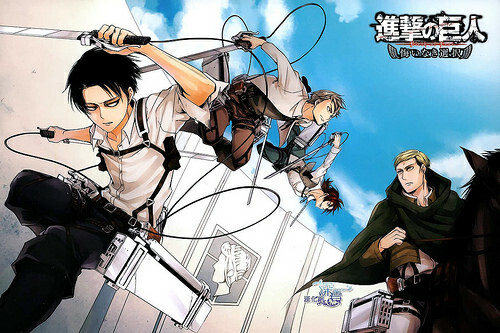 The “heroes” plan on destroying the leader of the squad, Captain Erwin. For now they shall play along and once Erwin has served his purpose….then they will destroy him! Well, Levi is a whole lot better in this manga than the main series. I really disliked him there due to how far he will go to protect his ideals. It’s fine to save the world, but you have to prevent yourself from becoming a villain in the process. There are complex scenarios where becoming the villain is used so that the others can be saved,(Yugioh GX) but the circumstances were completely different and it was done in a much more acceptable manner. Back on topic, the Levi in this series is more like your typical action hero. (Ignoring the fact that his whole mission is to destroy one of the “good” guys) Levi is skilled and he doesn’t fear any of the other humans. He’s not really friendly with other humans, but he means well. Levi is just always thinking about the mission so he has no time for sentiments. His two friends keep him in check as well. I may never get around to liking Levi as a character due to the main series, but I can definitely say that I like his portrayal in this series. The author certainly did a good job. Farlan is Levi’s other pal and he’s not incredibly interesting. It helps that his design is pretty similar to Erwin’s so it can be very easy to mix them up. Luckily, the plot usually doesn’t have them together so this isn’t a real problem. Farlan is usually the guy who gets Levi to back off from his quest on beating everyone up. Farlan’s a tough guy to read because you’re never sure of his true intentions. He doesn’t enjoy combat quite as much as Isabel or Levi yet he’s really into the mission of taking out Erwin…except when he’s not. I couldn’t really get a read on the guy. He’s definitely not a bad character so I guess he’s just average for me. The art for the manga is pretty solid. I would definitely make the case that it looks better than the original series. Everything is clear and even the fight scenes aren’t hard to follow. The Titan rampage scenes also aren’t as unnecessarily violent and it feels (Ironically enough since this is a Shojo series) more like a classic Shonen Jump battle. One reason why this spinoff is a lot better than the main series is because the violence isn’t quite as over the top. Now, I mentioned that it was good that the series is so short and this is the main reason. As it stands, the first volume was much better than the second one. 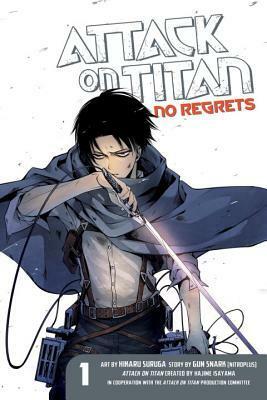 (The series would have gotten a 6/10 if it had just been a one shot) In the first volume, Levi still takes out a Titan and it’s still a violent act, but it’s not as detailed as it could be. The artist doesn’t place emphasis on the slash and it’s more of a normal effect that you would see from Bleach. It wasn’t over the top at all and I can definitely live with that. The second volume gets a little more dicey as it veers back into main series land. Cheap shots to the weak parts and a lot of humans getting taken down for the count are included this time. Levi taking out a bunch of titans is cool of course and it’s handled pretty well for the most part. I just don’t like when they go all Legend of Zelda on us and aim for the eyes. No, just defeat the villain! Making the heroes essentially beg for their lives before going up against the Titan may make the whole thing emotional, but it can also be a little over the top. (Of course, emotion is another thing that has to be carefully used. The classic example is Frieza blowing up Planet Vegeta. It was emotional and well done. Itachi taking out the Uchiha Clan? A little more towards the gritty to be gritty with plot hax side. Especially after the 30th plot twist.) Just die with a quick panel and let the Titan move on. Still, the violence is definitely a big step down from the main series and that’s a good thing. What isn’t cool in the second volume is that the horses get involved. I can’t wait until they bring in the cars so that the animals can be safe. Supposedly, Titans only eat humans so they would be safe otherwise. Luckily, the horse part isn’t necessarily graphic since they’re in the background, but it’s still enough to put down the book and sigh. Of course, one thing that is almost as bad is the fact that Hange actually got a few lines! I’m glad that Levi gave her the cold shoulder and then she’s written out. Please, we don’t need her drama right now. Overall, This was a pretty good prequel for Attack on Titan. I have to say that Levi proved to be a better main character than Eren and his friends could hold their own. This mini series is only two volumes so it didn’t have time to add in a lot of characters and plots, but that’s all right. This is just a nice stand alone story. I do think that the second volume wasn’t quite as good as the first one and started to show signs of the main series, but luckily it quickly ended before things could escalate. The ending is rather sudden, but it works. You sympathize with Levi and the humans one more time until you read the main series. I recommend checking this out if you like Attack on Titan and you should otherwise like it if you’re in the mood for a story about reaching out for your goals. (And being aware that this is related to Attack on Titan so it can be a little intense) Get ready for the ultimate battle against Titans! Marcus is one of the better main characters out there and he definitely wouldn’t put up with Levi’s hostile actions. Once the inevitable fight between them breaks out, Marcus would take the quick win. 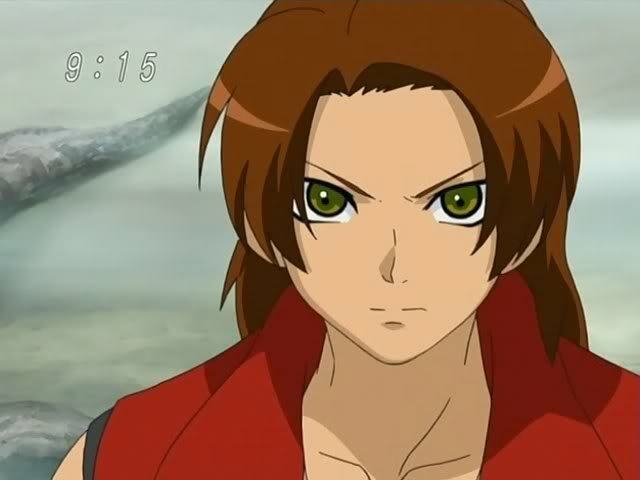 He’s a better hand to hand fighter and he’s had a lot of training thanks to his fights against the Digimon. Marcus’ fists haven’t let him down yet and I don’t expect them to start now! Marcus wins.